The St. Mary’s University Music Department invites you to enjoy our performances throughout the academic year. Most performances are free and open to the public. 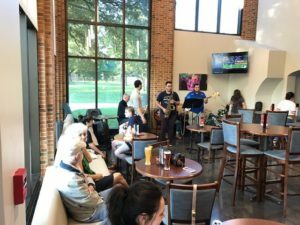 Hang out and listen to our awesome jazz students perform Monday nights at The Pub on the St. Mary’s University campus from 7 to 10 p.m. Listen to the music and enjoy a relaxing evening with friends, or bring your instrument and jam with the combo. Brought to you by the St. Mary’s University Department of Music and Student Life, Jazz Nights at The Pub are open to the public. The bar and grill will also be open for service. Performers include St. Mary’s University jazz students, alumni, professors and any community members looking to jam. Performances will feature different ensemble sizes, from small combos to the full St. Mary’s Jazz Orchestra. One of our premier events of the year is the annual Fiesta Jazz Festival and World Class Jazz Concert, held each year during San Antonio Fiesta Week. This is an official Fiesta event held on the St. Mary’s University campus. St. Mary's University San Antonio, TX EventScheduled 7:30 PM to 8:30 PM - Treadaway Hall, Recital Hall: The St. Mary's University Department of Music invites you to attend the Guitar Studio Recital.Guitar students will perform a variety of music from the Renaissance, Classical, Romantic, and Modern times. Featuring the music of John Dowland, Matteo Carcassi, Francisco Tarrega, Leo Brouwer, Prof. Leslie Lyon, and the Beatles. The music will be performed as duets, trios, and solos from non-music majors, music minors, and music majors. St. Mary's University San Antonio, TX EventScheduled 1:00 PM to 10:00 PM - Campus: Enjoy the great sounds of national, regional and local jazz artists at this year’s 57th Fiesta World Class Jazz Concert on Friday, April 26. The evening concert precedes outstanding University and Junior College jazz bands along with area jazz groups beginning at 1 p.m. Our main guest artist takes the stage at 8:30 pm. This concert offers the San Antonio community a unique and admission free family event.SCHEDULEUniversity Jazz Invitational1 to 6 p.m.Pecan GroveDescription: These afternoon performances will spotlight an array of outstanding area university and college jazz ensembles. 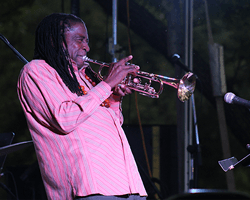 Fiesta World Jazz Concert6 to 10 p.m.Pecan GroveDescripton: The concert opens wiht vocalist Wednesday Ball, followed by Bill King Quartet and closes with this year's Fiesta Jazz Artist, jazz great, Rufus Reid and his quartet from New York City. The group features Steve Allee, piano; Yosany Terry, saxophone; Duduka Da Fonseca, drumset; and led by Rufus Reid on bass. This night should prove to be inspiration to everyone. To view a detailed schedule for Fiesta Jazz Festival, visit www.stmarytx.edu/fiesta-jazz.This event is sponsored by the Music Department at St. Mary’s University and the San Antonio Fiesta Commission. St. Mary's University San Antonio, TX EventScheduled 8:00 AM to 5:00 PM - University Center A and Recital Hall: The 57th Fiesta Jazz Band Festival on Saturday, April 27, is San Antonio's oldest educational jazz festival. We attract junior and senior high school jazz ensembles from Texas and neighboring states. Participants perform for criticism before a panel of renowned jazz clinicians. Trophies and awards are given for outstanding performances in various categories. Special jazz clinics take place through the day including a mid-day clinic by the Fiesta Jazz Artist. This event offers a unique educational and music performance experience and at the same time it gives the Fiesta audience and the San Antonio community an admission free family event. Fiesta Jazz Band Festival8 a.m. to 5 p.m.University Center, Conference Room A and Treadaway Hall, Recital HallDescription: A panel of distinguished jazz educators will critique 30 performing middle school and high school jazz ensembles. Jazz ClinicNoonUniversity Center, Conference Room ADescription: A special jazz clinic by Rufus Reid, a unique educational and music performance experience. Jazz Orchestra of San Antonio Performance5:15 p.m.University Center, Conference Room A Closing Ceremony and Awards5:50 p.m.University Center, Conference Room A To view a detailed schedule for Fiesta Jazz Festival, visit www.stmarytx.edu/fiesta-jazz. St. Mary's University San Antonio, TX EventScheduled All day event - St. Mary's University: Advance your musicianship this summer by working with top professionals on your instrument. Experience working with the camp’s featured artist, award-winning composer Michael Markowski.The camp is open to middle school and high school band students.Ensembles are conducted by Matthew Mireles, D.M.A., St. Mary’s University Director of Bands.FEATURED ARTISTMichael MarkowskiCAMP SERVICESElective classesEnsemble sectionalsFull-band rehearsalsTechnique classesCOST AND REGISTRATION$275 per studentRegistration opens Spring 2019For more information about Summer Band Camp at St. Mary’s, visit www.stmarytx.edu/band-camp.